Aitor Karanka (left) and captain Grant Leadbitter have guided Boro to the League Cup quarter-finals. Middlesbrough must be proud of their reputation as "one of the teams to beat" in the Championship, says head coach Aitor Karanka. Hull City defender Andrew Robertson, whose side face Boro on Saturday, has praised the Teessiders' form and style of play. Hull currently top the division on 31 points, with Boro in fourth with 30. 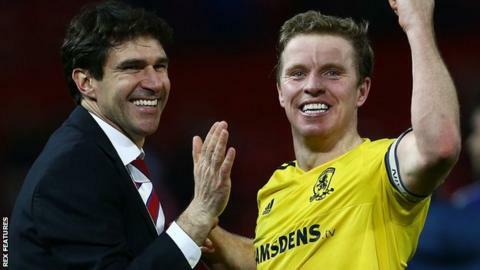 "Everybody wants to beat us and that's because we're doing well, we can't relax," Karanka told BBC Tees. "I was a player and you want to be the best team, or one of the better teams, and they [other teams in the Championship] consider our players as some of the best in the league. "It's a good thing for us and we have to be proud - we can't relax though." In addition to their league form, Middlesbrough are through to the League Cup quarter-finals, having eliminated Manchester United on penalties in the last round.